An ozonator helps sanitize hot tub water by destroying bacteria and viruses that may be present in the water. It also helps break down biodegradable materials to help keep the water pure, clear and with that “feel good” quality. Ozone generators contain either an ultraviolet light bulb or an electronic corona discharge device that converts oxygen to ozone. The ozone gas is routed through an airline connected to a water jet. The water running through the jet creates a venturi and pulls the ozone into the hot tub water during its filtration cycle. Nordic Hot Tubs currently uses 2 types of ozone generators. Nordic Clean™ is an electronic advanced plasma gap ozonator. 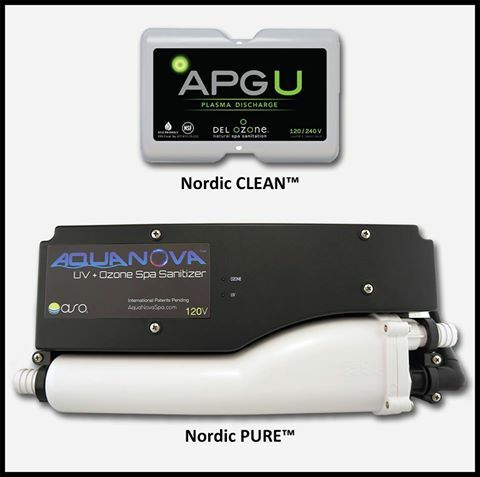 Our Nordic Pure™ combines ozone generation with UV-C sterilization for a 2-stage water sanitization. The brands we use are manufactured by industry leaders which specialize in providing ozonators for hot tubs holding up to 1000 gallons. The Nordic Clean™ is an electronic corona discharge ozonator. It converts oxygen to ozone, is more energy efficient than UV ozone generators and is lower in overall power consumption, heat generation and operating cost. It is available on all Nordic Hot Tub models. The Nordic PURE™ is a combination of ozone (O3) and UV-C technologies. This 3-step process has more sanitizing power, less hassle,and significantly reduces residual chlorine consumption to deliver the most advanced sanitation potential available. It is not available on Nordic’s Bella™ or All-In-110V™ models. Call us Today & Continue Living Life the way you want!